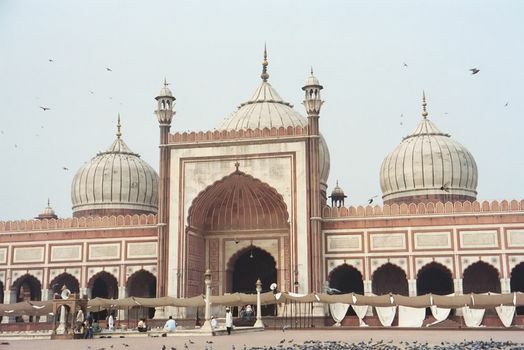 The Jami Masjid, or Friday Mosque, was built by Shah Jahan in 1644-58. 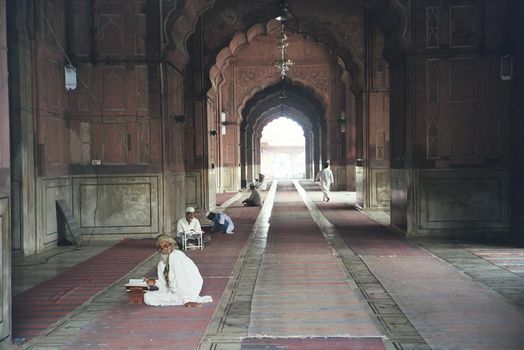 It can be compared with the mosque at Fatehpur Sikri, built by Akbar, Shah Jahan's grandfather, and with the Badshahi Mosque of Lahore, Pakistan, which was built by Shah Jahan's son, Aurangzeb. 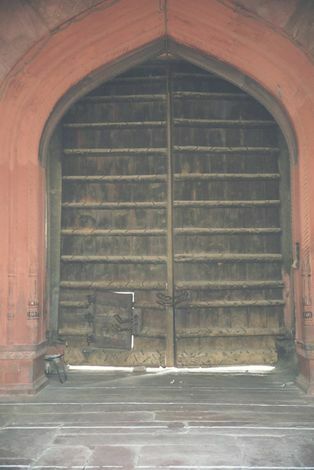 Only Shah Jahan and his successors used the eastern gate, closed to everyone else. The eastern gate opens on a plaza 325 feet square. 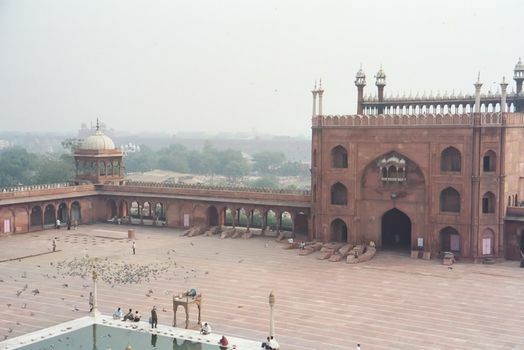 At the far side of the square is a wide but narrow prayer-hall open on three sides and capped by bulbous domes. 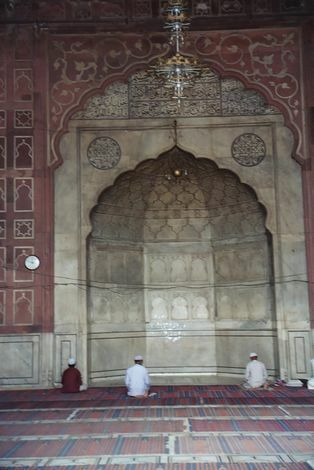 The main arch, the iwan, leads to the qibla wall with its mihrab, or prayer niche. 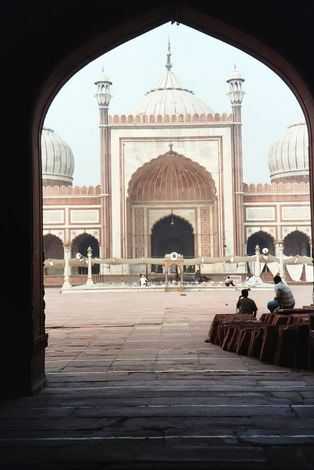 A view of the prayer hall's sandstone and white-marble exterior. 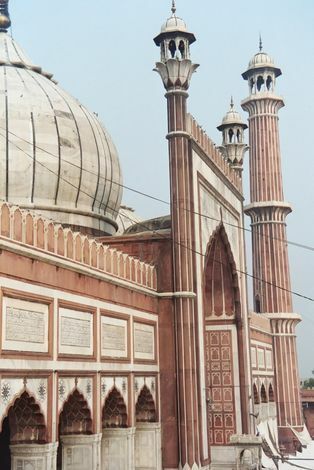 The partially obscured minaret is one of a pair; its partner can be climbed. The square from the base of that partner. In the middle is a basin, the hauz; in front of it is a platform, the dikka, atop which a second prayer leader (muballigh) helped guide the huge congregation in the days before loudspeakers. Cloisters rim the plaza. The royal family prayed from private rooms above the gateway. Looking down and east from the top of the same minaret. 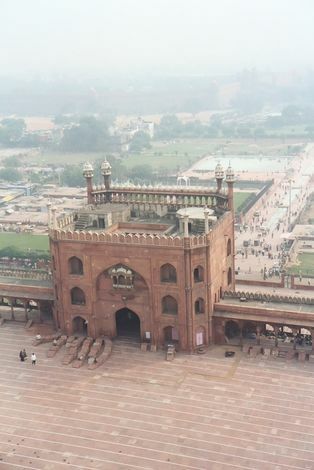 The Red Fort lies in the distance. The prayer hall is eleven bays wide but only one deep. The unusual single-aisle form can be traced back about 150 years to 1494, when Sultan Sikandar Lodi built the Bara Gumbad mosque, in the nearby Lodi Gardens. Scholars are inclined to say that the reasons for this form are unknown, but Francois Bernier, writing from Delhi in 1663, thought it no mystery, with "the extreme heat and the climate rendering such an opening absolutely necessary" (Archibald Constable translation). The central mihrab, or niche, marks the direction of Mecca; so, for that matter, does the wall, which defines the qibla, or axis of prayer. On the other side of the wall, there's a street and residential neighborhood.